Since we’ve been on our little journey to cut processed foods out of our diet and sticking to eating from scratch over the last few years, I’ve found that as time goes by I crave less and less chocolate. All that being said, I still love a good chocolate treat now and again! Normally I bake cookies like our easy No-Bake Cookies or the Oatmeal Lace Cookies and drizzle some chocolate on the top but this time I really wanted a delicious treat (and I really really don’t want to turn the oven on much in the summer!). 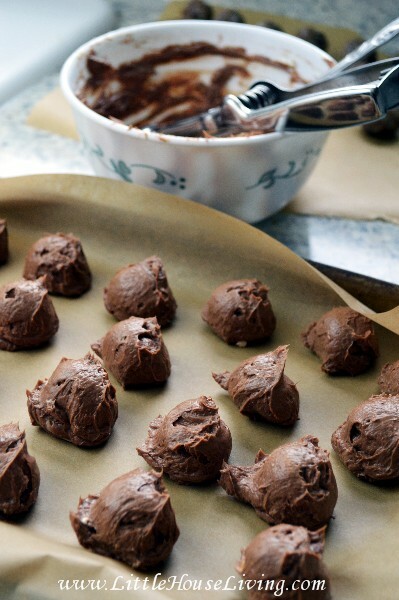 These Simple Chocolate Truffles were the perfect solution. They are no bake and SO easy to make! Plus you only need 2 ingredients for these little delights. I hope you enjoy them, we are loving them for a special treat! 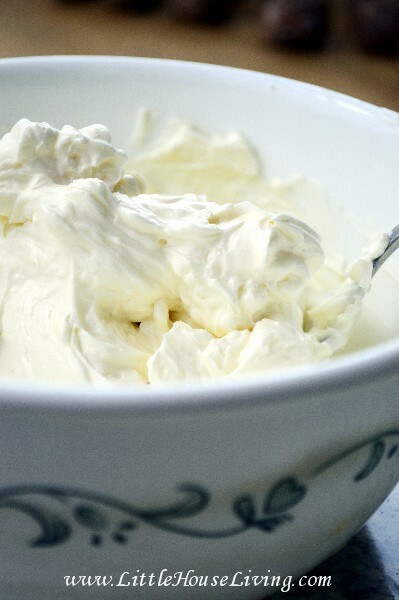 Place the cream cheese in a bowl. 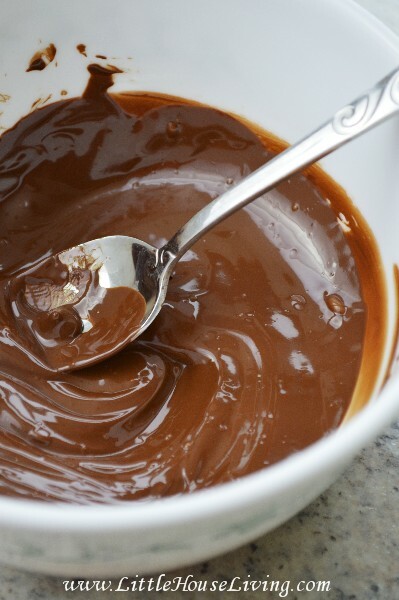 You want it to be softened slightly so you are able to easily mix in the chocolate but you don’t want it too melty so that you can’t form balls with it. Placing it at room temp for a bit before you plan on making these will do the trick. Melt the 1/3 cup chocolate chips in another bowl. You can do this on the stove top or in the microwave. Stir to make sure there are no large pieces. 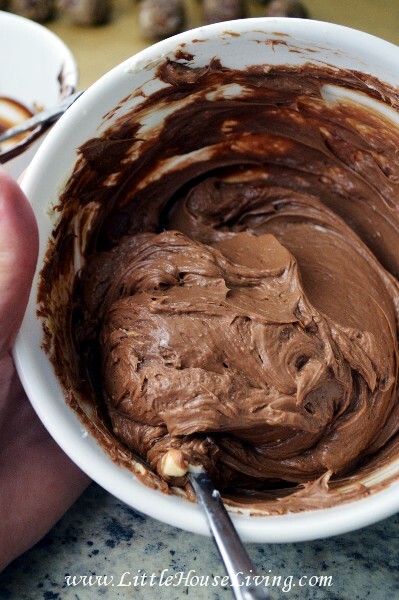 Pour the melted chocolate into the cream cheese. Are you drooling yet? 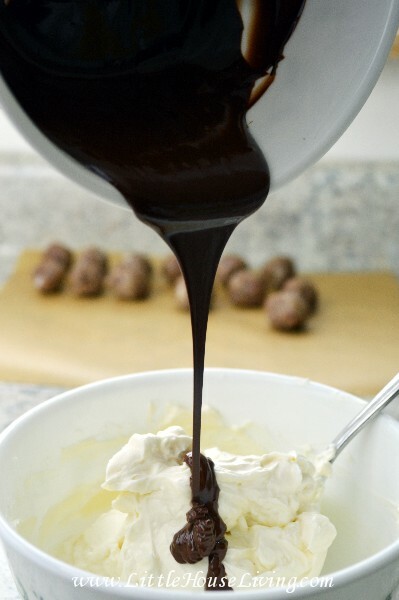 Whip the melted chocolate into the cream cheese. 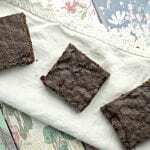 I was able to easily incorporate it by just using a spoon but you would also use an electric mixer to make sure all the chocolate is mixed in and there are no large pieces of plain cream cheese left. Using a small cookie scoop (or just a spoon), drop spoonfuls of the mixture onto a cookie sheet that is covered in waxed paper. Place this pan in the fridge and let the balls chill for a few hours until they are hardened. Once the truffles are hardened, melt more chocolate chips and dunk the balls until they are coated. If you don’t want to use so many chocolate chips, you can skip this step and coat the truffles in cocoa powder instead. 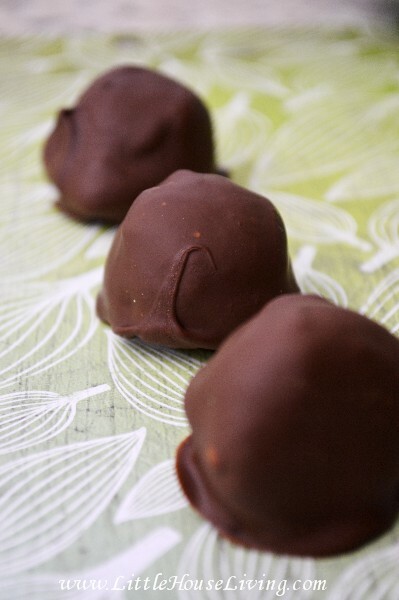 Yum, these Simple Chocolate Truffles are such a tasty treat! Store in a covered container in the fridge until you are ready to enjoy. You could add in different flavorings (like orange or raspberry) for a little bit of a different treat or even whip in some peanut butter for chocolate peanut butter truffles! Want to watch me make these truffles? Here’s a quick video with the step by step instructions! What is your favorite no bake summer treat? Make sure you check out our Desserts and Treats page for all kinds of yummy dessert recipes from scratch! These look yummy and the simplicity of the recipe is appealing. Questions: How many candies does this make? And do you know if fat-free cream cheese would give an appropriate consistency? I think it would, but just wondering if you had tried it? Also, would Tofutti “cream cheese” work? I have a vegan eater in my family. Thanks for all your great ideas! I haven’t tried the recipe with anything but regular fat cream cheese, I’m pretty sure it would work with the lower fat and the other cream cheese but you just may have to cool them longer or maybe even freeze them so they don’t melt in the chocolate. This recipe makes about 20 depending on how large you make them. Great! We’ll be giving these a try this weekend for Easter! Thank you for the wonderfully simple recipe…I think my grand-daughters (ages 4 & 5) will have to make these on Friday! For an even richer smoother chocolate coating, melt 1/2 chocolate chips and 1/2 butterscotch chips. Great taste! These look so good, I can’t wait to make them! Pinned it and thanks for sharing! These look so amazingly delicious! I’ve always used cream in truffles, making a sort of ganache – but I bet these are richer. Just love this recipe!!! I bought some lovely eastereggmolds for making chocolate eastereggs last year and I coated them with chocolate and then stuffed them with this stuffing. They are delicious :-D. Thanx!!! Do you prefer not to sweeten the cream cheese? thanks for sharing. This looks super easy – and even slightly nutritious! Thanks for the great idea. these sound delicious and so easy to make! Yum these sound delicious (and easy) I can’t wait to try them. Thanks for sharing on Great Idea Thursdays. This is divine! 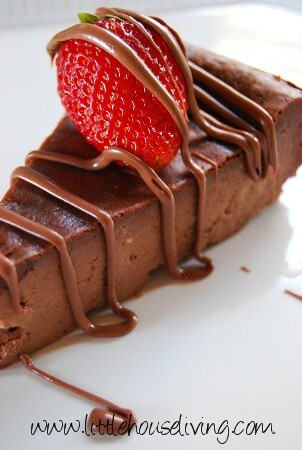 I’m on a diet and allowed to eat chocolate.. looking for a good recipe and this is perfect! These look absolutely delicious! I’m pinning now and can’t wait to try them. I would love for you to link up this recipe to my Tasty Tuesday recipe link party here! I actually made these many years ago, one Christmas…and they were some of the most delicious truffles I’ve ever had! So easy, but so good. I didn’t dip mine, but rolled them in powdered sugar and finely chopped nuts. The cocoa powder was a bit bitter for me! Thanks for this reminder- will have to make them again! OMG! How easy this is! I will HAVE to try these!! Thank you for sharing with us at What We Eat Wednesday‘s link up! I’ve also pinned this recipe on my WWEW board! Don’t forget to come back every week with your new or old recipes! Alexis at Laugh. Eat. Learn. 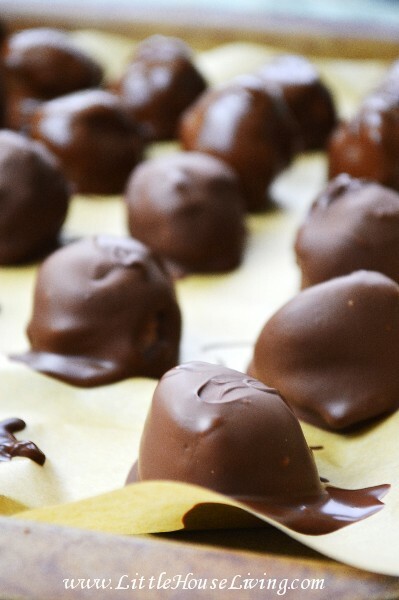 What a fabulously simple truffle recipe. Thanks again for sharing at Simple Supper Tuesday. Oh my gosh. I need this pinned ASAP. I love cream cheese. Look forward to reading more! Seriously! Oh my goodness do these look amazing. I have come to find that simple is not only good, it is soooo good! I am counting days for an excuse to try these 🙂 You are a Fabulous Feature! Wow these look amazing! I can’t believe you only need so few ingredients, and they look like they are from a fine candy store. I really want to try this recipe! I’m so glad you shared it with us at Saturday Night Fever 🙂 Pinned! These look great! Easy is always a plus. Thanks for linking up at Cook it! Craft it! Share it! These look delicious, I love how they are made with just two ingredients! Thanks for linking up to Sweet and Savoury Sunday, stop by and link up again. Have a great weekend!! Amazing – these would make a great gift! Thanks so much for linking up and sharing with your friends at the Thoughtful Spot Weekly Blog Hop! 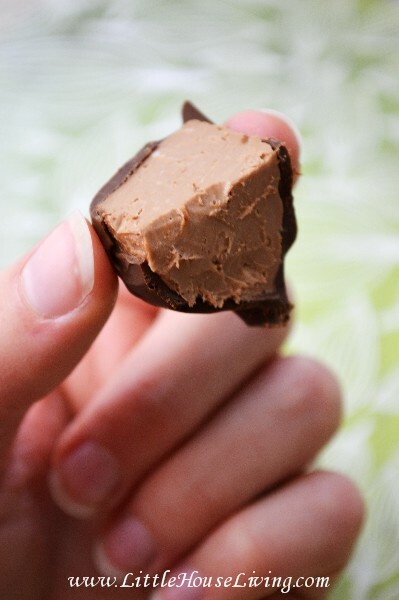 Oh my goodness, I have a weakness for truffles, the thought of a peanut butter truffle makes me weak in my knees! I am pinning this! Hmmm, I’ve not have that issue with this recipe. Did you leave them in the fridge for a good amount of time and was your kitchen really warm when you took them out? They will warm up quickly if the kitchen is warm. Sorry you are having trouble! I made these tonight for my family and they were such a success! Everyone loved them, and my mom said they tasted like chocolate cheesecake. Hi 🙂 I just wanted to know what kind of chocolate chips? Semi-sweet or milk chocolate?? Thanks so much for asking. I am in the middle of these right now, scrolling down hoping someone had asked that question! Do they have to stay refrigerated? I would love to make them for gifts. They do need to stay refrigerated. These look so simple and scrumptious—I can’t wait to try them! 🙂 Your post has been selected to be featured on Family Fun Friday—just stop by my blog to grab your “Featured” button (on Thursday, January 8 I will share your post and the button). I am the new recipe hostess. 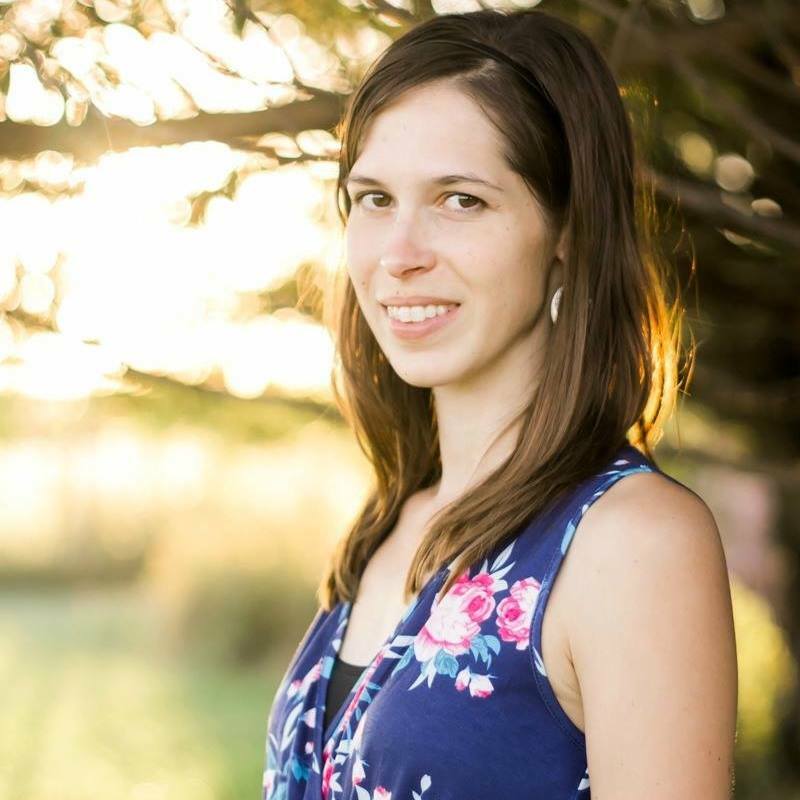 Thanks for sharing this lovely post at the Linky Party! These look delicious! 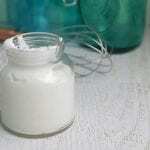 I want to whip up a batch for the hubby and my kids. These look AMAZING! I’m going to have to try these soon. 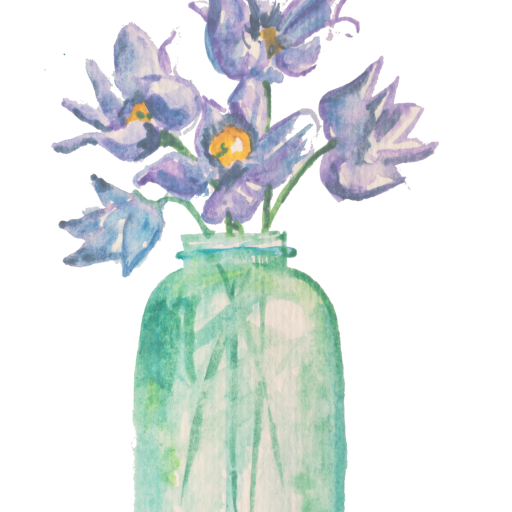 I liked this post so much I decided to make it one of my features at the next Frugal Crafty Home Blog Hop! Thanks so much for sharing this awesome recipe with us! Thanks for the feature Carrie! Oh my goodness these sound ah-mazing! F Y I. Hershey makes chocolate chips in flavors. I went to Hershey, Pa. And brought home chips in mint, raspberry and one other that I can’t remember but they were to die for! 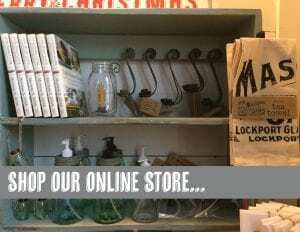 I am sure that you aren’t going to run to Hershey right away but you can order then online. Not expensive either! ! Have fun! ! These look amazing!! Hope you stop by and share your stuff on My 2 Favorite Things on Thursday Link Party !! It is still going on! I would love to have you! Hi, I’m making some of these this weekend. My favorite featured at this Turn it Up Tuesday! My little chocolate lover would be drooling over these! Thanks for linking up at the Thoughtful Spot Weekly Blog Hop! We hope you join us again next week! Wow, I can’t believe how simple they are. I would love to try this recipe and see how they taste. My kids would love that. Visiting from Turn It Tuesday! These look absolutely divine, I can’t wait to make them, and so simple to make! I love how easy these are and will definitely give them a try. I’m pinning so I’ll remember. Visiting from HMCW. I didn’t even have to read it at first. I just saw the pix and Pinned. Because I love nothing more than a good truffle. THEN I read it. Oh so good and can’t wait to try. Over from Pam’s blog hop! Anything with cream cheese is definitely a win. 😉 These looks delicious! 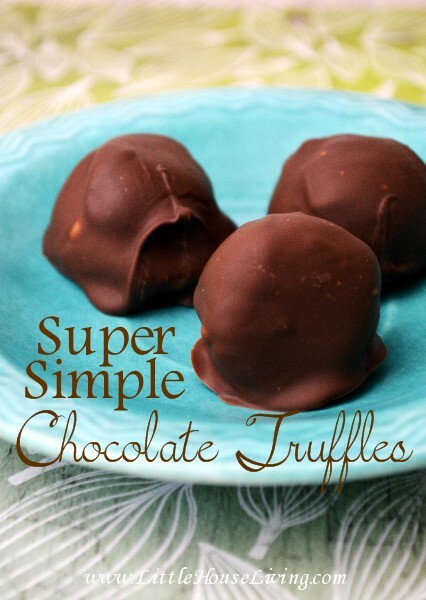 I love truffles and they are so easy to make. I had made some for Christmas and frozen them. We were so disappointed to find the freezer door open the next day and we had to throw them out. Thanks for sharing with Small Victories Sunday Linkup. Pinned to our linkup board and tweeted. Oh, they sound absolutely delicious! If you have time, I would love for you to come and share this post over at the Really Crafty link party that is live right now! That looks so yummy! I am going to have to try the recipe. Thanks so much for sharing this at last week’s Friday Favorites Party. I chose it as one of this week’s features. I hope you will come back and party with us again this week.